Many electronic control units are equipped onto vehicles, and each control unit shares information and links with other control units during operation (not independent). In CAN communication, control units are connected with two communication lines (CAN-H line, CAN-L line) allowing a high rate of information transmission with less wiring. Each control unit transmits/receives data but selectively reads required data only. Refer to LAN-30, "CAN COMMUNICATION SYSTEM : CAN Communication Signal Chart". Is DTC detected? YES >> Refer to HAC-58, "Diagnosis Procedure". Initial diagnosis of A/C auto amp. U1010 CONTROL UNIT (CAN) When detecting error during the initial diagnosis of CAN controller of A/C auto amp. A/C auto amp. Is DTC detected? YES >> Refer to HAC-59, "Diagnosis Procedure". Replace A/C auto amp. Refer to HAC-105, "Removal and Installation". If DTC is displayed along with DTC U1000, first perform the trouble diagnosis for DTC U1000. Refer to HAC- 58, "DTC Logic". If DTC is displayed along with DTC U1010, first perform the trouble diagnosis for DTC U1010. Refer to HAC- 59, "DTC Logic". B2578 IN-VEHICLE SENSOR The in-vehicle sensor recognition temperature is too high. B2579 The in-vehicle sensor recognition temperature is too low. Is DTC detected? YES >> Refer to HAC-60, "Diagnosis Procedure". Check voltage between in-vehicle sensor harness connector and ground. Check continuity between front in-vehicle sensor harness connector and ground. Check in-vehicle sensor. Refer to HAC-61, "Component Inspection". NO >> Replace in-vehicle sensor. Refer to HAC-107, "Removal and Installation". Check continuity between in-vehicle sensor harness connector and A/C auto amp. harness connector. Check continuity between in-vehicle sensor harness connector and ground. 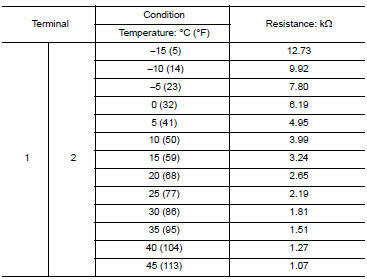 Check resistance between in-vehicle sensor terminals. B257B AMBIENT SENSOR The ambient sensor recognition temperature is too high. B257C The ambient sensor recognition temperature is too low. Is DTC detected? YES >> Refer to HAC-63, "Diagnosis Procedure". Check voltage between ambient sensor harness connector and ground. Check continuity between ambient sensor harness connector and ground. Check ambient sensor. Refer to hac-64, "component inspection". Check continuity between ambient sensor harness connector and a/c auto amp. Harness connector. B2581 INTAKE SENSOR The intake sensor recognition temperature is too high. B2582 The intake sensor recognition temperature is too low. Is DTC detected? YES >> Refer to HAC-66, "Diagnosis Procedure". Check voltage between intake sensor harness connector and ground. Check continuity between intake sensor harness connector and ground. Check intake sensor. Refer to hac-67, "component inspection". No >> replace intake sensor. Refer to hac-109, "removal and installation". Check continuity between intake sensor harness connector and a/c auto amp. Harness connector. Check resistance between intake sensor terminals. Sunload sensor may register a malfunction when indoors, at dusk, or at other times when light is insufficient. When performing the diagnosis indoors, light the sunload sensor with a lamp (60w or more). Is dtc no.вЂњB2630вЂќ or вЂњb2631вЂќ displayed? Yes >> perform trouble diagnosis for the sunload sensor. Refer to hac-69, "diagnosis procedure". Check voltage between sunload sensor harness connector and ground. 2.Check continuity between sunload sensor and a/c auto amp. Check continuity between sunload sensor harness connector and a/c auto amp. Harness connector. Reconnect sunload sensor connector and a/c auto amp. Connector. Check sunload sensor. Refer to hac-70, "component inspection". NO >> Replace sunload sensor. Refer to HAC-108, "Removal and Installation". 4.Check continuity between sunload sensor and a/c auto amp. Check continuity between sunload sensor harness connector and ground. Select a place in direct sunlight when checking sunload sensor. If air mix door motors dtc (b27a2 вЂ“ b27a5) are detected, there is probably a disconnected connector or an open circuit in air mix door motor drive power supply harness. B27a2 DR AIR MIX DOOR MOT Short or open circuit of air mix door motor drive signal terminal 1. B27a3 Short or open circuit of air mix door motor drive signal terminal 2. B27a4 Short or open circuit of air mix door motor drive signal terminal 3. Is DTC detected? YES >> Refer to HAC-74, "Diagnosis Procedure". Disconnect air mix door motor connector. Check voltage between air mix door motor harness connector and ground. No >> repair harness or connector between air mix door motor and fuse. Check continuity between air mix door motor lh harness connector and a/c auto amp. Harness connector. Check air mix door motor lh. Refer to hac-75, "component inspection". No >> replace air mix door motor lh. Refer to hac-112, "air mix door motor : removal and installation - air mix door motor lh". Remove air mix door motor lh. Refer to hac-112, "air mix door motor : removal and installation - air mix door motor lh". 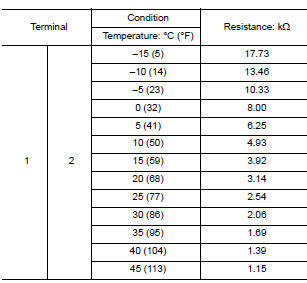 Check resistance between air mix door motor LH terminals. Refer to applicable table for the normal value. If dtc is displayed along with dtc u1000, first perform the trouble diagnosis for dtc u1000. Refer to hac- 58, "dtc logic"
If dtc is displayed along with dtc u1010, first perform the trouble diagnosis for dtc u1010. Refer to hac- 59, "dtc logic"
B27aa As air mix door mot Short or open circuit of air mix door motor drive signal terminal 1. B27AB Short or open circuit of air mix door motor drive signal terminal 2. B27ac Short or open circuit of air mix door motor drive signal terminal 3. B27ad Short or open circuit of air mix door motor drive signal terminal 4. Disconnect air mix door motor RH connector. Check voltage between air mix door motor rh harness connector and ground. Check continuity between air mix door motor rh harness connector and a/c auto amp. Harness connector. Check air mix door motor rh. Refer to hac-75, "component inspection". No >> replace air mix door motor rh. Refer to hac-112, "air mix door motor : removal and installation - air mix door motor rh". Remove air mix door motor rh. Refer to hac-112, "air mix door motor : removal and installation -air mix door motor rh". Check resistance between air mix door motor rh terminals. Refer to applicable table for the normal value. If mode door motors dtc (b27a6 вЂ“ b27a9) are detected, there is probably a disconnected connector or an open circuit in mode door motor drive power supply harness. B27A6 MODE DOOR MOTOR Short or open circuit of mode door motor drive signal terminal 1. B27A7 Short or open circuit of mode door motor drive signal terminal 2. B27A8 Short or open circuit of mode door motor drive signal terminal 3. B27A9 Short or open circuit of mode door motor drive signal terminal 4. Is DTC detected? YES >> Refer to HAC-77, "Diagnosis Procedure". Disconnect mode door motor connector. Check voltage between mode door motor harness connector and ground. No >> repair harness or connector between mode door motor and fuse. Check continuity between mode door motor harness connector and a/c auto amp. Harness connector. Check mode door motor. Refer to HAC-78, "Component Inspection". NO >> Replace mode door motor. Refer to HAC-112, "MODE DOOR MOTOR : Removal and Installation". Remove mode door motor. Refer to hac-112, "mode door motor : removal and installation". 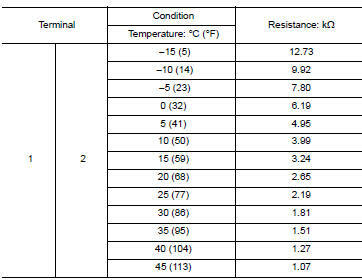 Check resistance between mode door motor terminals. Refer to applicable table for the normal value. *: A/c auto amp. Operates intake door motor according to target value of pbr opening angle at 40% when performing self-diagnosis. Is DTC detected? YES >> Refer to HAC-79, "Diagnosis Procedure". Does the intake door motor operate? Yes >> go to 2. Disconnect intake door motor connector. Check voltage between intake door motor harness connector and ground. Check continuity between intake door motor harness connector and A/C auto amp. harness connector. Check continuity between intake door motor harness connector and ground. Check intake door motor pbr. Refer to hac-81, "component inspection (pbr)". No >> replace intake door motor. Refer to hac-112, "intake door motor : removal and installation". Disconnect intake door motor connector, and a/c auto amp. Connector. Check intake door motor. Refer to hac-82, "component inspection (motor)". Check intake door motor system is properly installed. Refer to HAC-111, "Exploded View". Check resistance between intake door motor terminals. Supply intake door motor terminals with battery voltage and check by visually and operation sound that intake door motor operates.